"Have just found out my application for settled status in UK has been rejected. I now need to find evidence of residence since 2013. Not a good feeling," Prof Muijs wrote on Twitter. Tom Bennett, the government's adviser on behaviour in school, replied: "How ridiculous and distressing for you. I'm ashamed you've had to go through this process." 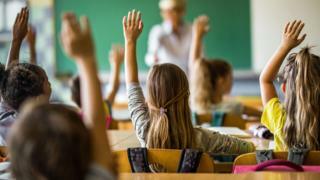 David Weston, an expert adviser to the Department for Education and head of the Teacher Development Trust, described it as an "embarrassment". The European Parliament's Brexit coordinator Guy Verhofstadt said on Twitter that the difficulties faced by Prof Muijs were "unacceptable". Prof Muijs has been a longstanding expert on education in the UK, having previously held professorships in the University of Southampton, University of Manchester and University of Newcastle and worked as a senior lecturer at the University of Warwick. He has served on expert bodies and advisory groups and is the co-editor of an education research journal. Prof Muijs says he has been in full-time employment in the UK for more than 20 years, including for the government's own education watchdog, which he says would be apparent from National Insurance records. But he says the application system told him there was insufficient evidence to approve the application. The Home Office says that Prof Muijs has not been turned down, but the automated checking process has not had the information needed for an approval, and that he should get in touch for further clarification. "This case has not been refused. We would encourage the applicant to make contact with the Settlement Resolution Centre, who will be able to assist him with his application," said a Home Office spokesman. "Over a quarter of a million EU citizens have already successfully been granted status under the EU Settlement Scheme and we received over 50,000 applications in the opening weekend," said the spokesman. The Home Office says it does not need to know how long someone has been resident, only whether it is more or less than five years - and the "automatic checks against government data" are a way of simplifying the process. In tests before the system went live, the Home Office says almost eight in 10 applications did not need to provide any further evidence of residence. About 17% of academic staff in UK universities are from the EU - almost 36,000 people - with concerns raised by university leaders that the end of freedom of movement could make it harder to recruit from the EU.